To get a true historical perspective of the City of Vancouver in Canada one should visit the original site which is now known as Gastown. 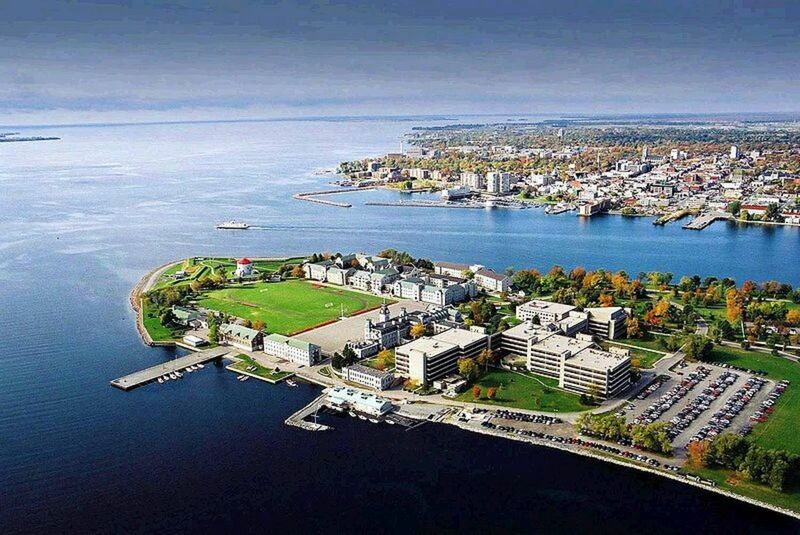 This particular area dates back to the time when Canada first became a nation. Back then native Indians lived there and some of the very first white settlers developed a prosperous lumbering industry. Gold exploration also brought prospectors to what was to become Canada back in those early days. In the lumber mills alcohol was not allowed on site. The arrival of "Gassy Jack" Deighton changed the leisure time habits of the lumbermen working at the saw mills forever. Jack Deighton was a river boat pilot turned tavern and hotel owner. Supposedly he was a great talker and could spin tales endlessly thus the name "Gassy." He offered to bring whisky to the lumbermen if they would build him a tavern. It did not take much persuasion on his part to get that accomplished. Soon after a hard day's work the lumbermen would cross over to Gassy Jack's tavern and enjoy some whisky and be entertained with never ending stories for hours. This they liked! Prior to that saloon being built the closest one was about 25 miles away. The saloon was part of a two story hotel named the Deighton Hotel. Further development of the area ensued. In 1870 the area was called Granville named after the British colonial secretary Earl Granville. However locals still referred to it mostly as Gastown. 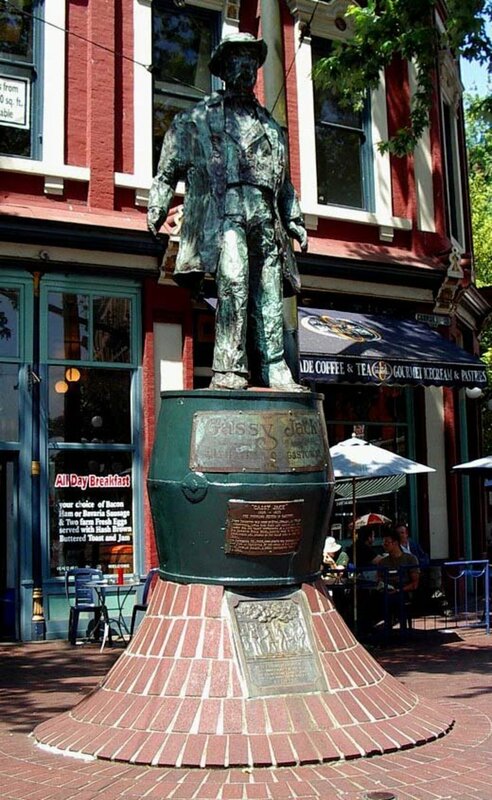 In 1886 this area of Gastown was incorporated into the City of Vancouver which was named after a British explorer George Vancouver. But shortly after that a raging fire practically decimated the area. All but 2 of the original buildings burned to the ground and were ruined. With much effort it was once again rebuilt into a livable community when the Great Depression occurred. As with most of the country it was hit hard but did not rebound as other areas did. It turned into something of a "skid row" and was no longer a desirable area. Discussion among some residents in Vancouver would have had the entire area razed but there were others who wanted to preserve Gastown because of it's historic significance. 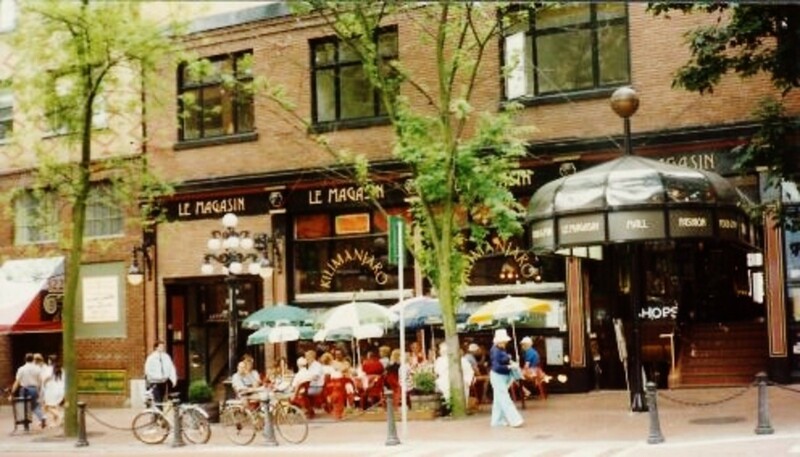 Those people's ideas prevailed and in the 1960s after renovation efforts succeeded Gastown was reborn. The cobblestone streets and mixture of building styles makes this a unique area in which to visit today. 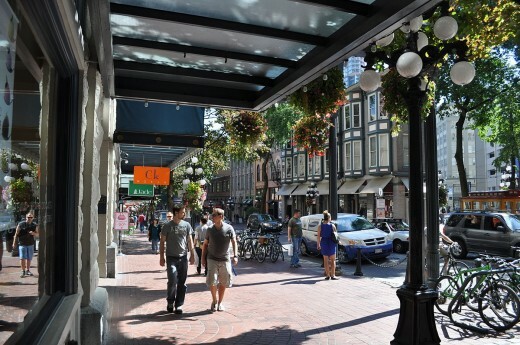 Of course there are a great number of businesses that now call Gastown home. Tourists can find almost anything that they could desire by way of restaurants, shops, etc. 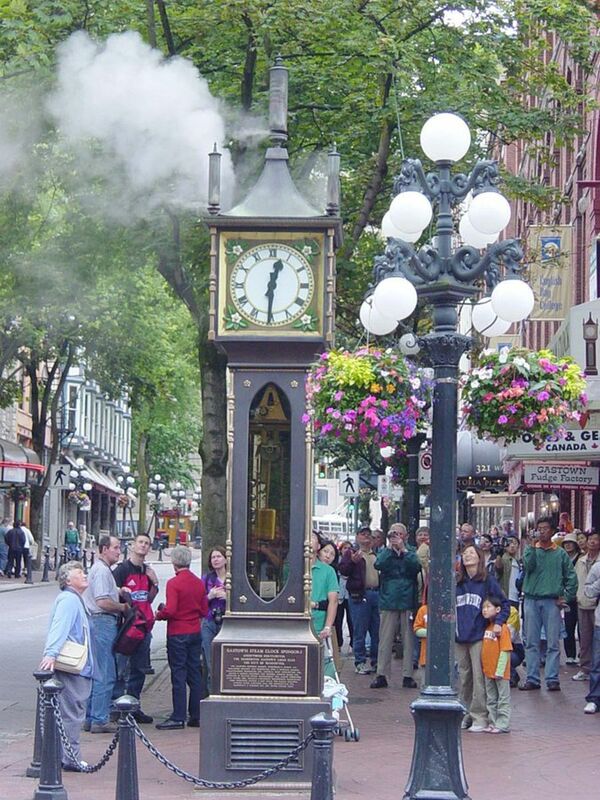 One interesting and unique landmark is the Edwardian designed Steam Clock which graces a street in Gastown. It was the very first of its kind in the world! The Steam Clock stands 16 feet high and has a clock face on all four sides framed in antique bronze. It is powered by an underground steam mechanism that also heated buildings in the area. One can view the steam escaping from the top of the clock and every quarter hour you can also hear the musical sounds that emanate from the world famous steam clock. 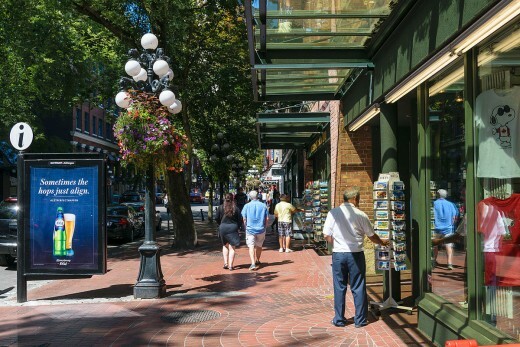 Tour buses regularly take visitors through this historic neighborhood of Gastown in Vancouver and it is one sight that will definitely add to your enjoyment of understanding the history of this third largest cosmopolitan city in all of Canada. There are very few functioning steam clocks in the world and several of them just happen to be in Canada. This particular one was built by clockmaker Raymond Saunders in 1977. Every quarter hour it has a whistle chime that plays the Westminster Quarters. Have you ever seen a steam powered clock? I did not know that there was such a thing. I had heard of them but never saw one in person. That clock is certainly an attention grabber. Wishing you a wonderful new year also and hope you are surrounded by legions of angels. There can't be many steam powered clocks in operation these days. It is the only one that I have ever seen in person or heard it when it whistled. Stay warm up there tonight! It is supposed to be mid-20's in Houston tonight! Brr! Appreciate the votes and share. Happy New Year to you Peggy...been wanting to say that for four days. Wishing you much happiness and joy this year. Very interesting and great photos as usual. I don't think I've ever heard of a steam powered clock before. This looks like a great place to keep in mind for summer vacation. Right now it's so cold here in N. Texas it's hard to believe in just a few weeks it will be horrible hot again. Voting this article up and BAUI, sharing with followers. There is so much to see and do in the beautiful city of Vancouver. We spent 5 days there while on vacation one year and could have spent much more time. I think that you would really enjoy visiting there! Other hubs tell more of the story! I've never even thought about visiting Vancouver before this; that's what I love so much about HubPages. I enjoyed this hub -- both the history and the photos. I would now love to visit. Voted up and more! This hub merely featured just the Gastown neighborhood which is a small older part of Vancouver. We were introduced to it when taking a tour of the city. 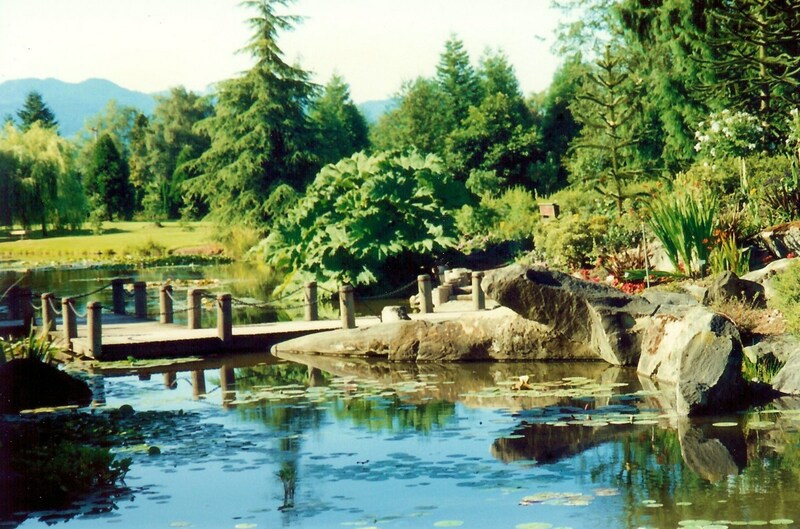 To see more of Vancouver, check out my other related hubs. We fell in love with that gorgeous city...especially Stanley Park. Thanks for your comment. Hope you get to visit up there someday. Gastown is just one of the interesting old neighborhoods in Vancouver. If you plan a visit there, you should see it and many other places as well. We were introduced to it on a tour of the city. Vancouver is a great and scenic city! Thanks for your votes and comment. 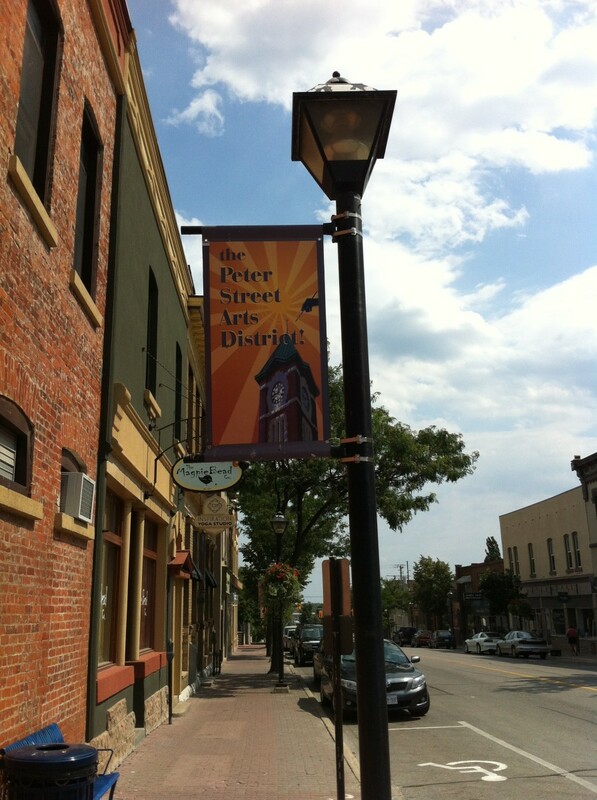 Like the idea of cobblestone streets and the steam clock. You did a good job of detailing the history of the city and generating my interest in visiting one day. Thanks. The neighborhood of Gastown is old and quaint but that steamclock out on the sidewalk in a public area that operates every quarter hour and plays a tune really sets it apart. It is the only operational steam driven clock that I have ever seen...and there are not that many in the entire world. 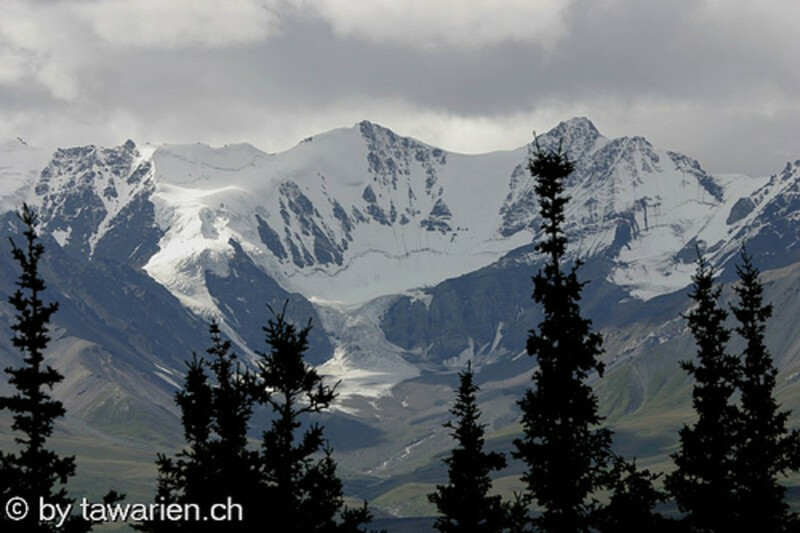 Appreciate your comment, vote and the share. I have never been there, but it looks like it would be a fabulous place to visit! I love unique, quaint places as this appears to be. Thanks for sharing this information. Voted up and useful. What an interesting place this must be to visit. I couldn't believe a steam powered clock!! I did spend a little time in Vancouver when my daughter worked in Seattle, but I didn't have the time to spend like I would have liked. You have been so fortunate to have visited the places you write about. We first were introduced to Gastown when we took a tour of Vancouver. Then we went back on our own to see more of that historic neighborhood. It was the first steam clock that we had ever seen, and it is not only unusual but certainly draws attention as it regularly goes through its cycles. Thanks for your comment and votes. Your descriptions of Gastown remind me a lot of the old part of Seattle, not to far from Vancouver. Alas, I missed this area when I was in Vancouver. That steam clock sounds fascinating -- never heard of one before. Voting this Up and Interesting. Yes there were many native (red) Indians living in North America prior to its being "discovered" by people from other continents. 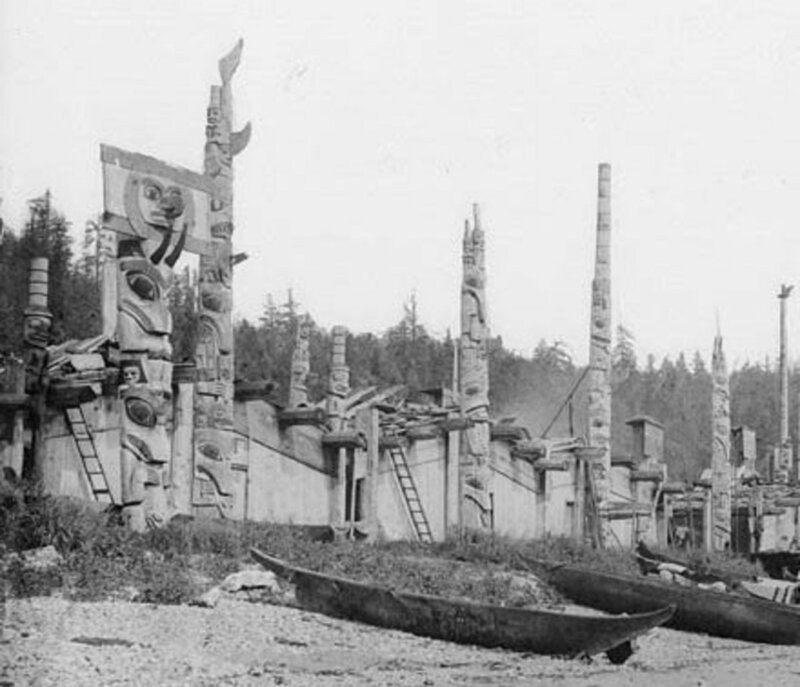 There are a great number of beautiful totem poles in the Vancouver area that came from the Indian tribes and museums are filled with artifacts from the Indian tribe settlements of long ago. Glad that you enjoyed this history of the Gastown area in Vancouver. Hi! Nice historical description of evolution of Vancouver! I see you are working your way through a good many of my travel hubs. Since you are planning a re-visit to Vancouver Island in the future...and if you are also going to get back to Vancouver on the mainland, be SURE and visit Stanley Park. Great place to visit with lots to do and see. We walked to the Gaslamp district (should have taken the bikes from the hotel - quite a ride), anyway, we found all kinds of restaurants and other neat little shops. A very good time. We meant to get over to stanley park but we weren't able to. Isn't there a suspension bridge in the park ? I thought someone said something about that. My pleasure, Enelle. There is so much to like about Vancouver and that entire area! Happy that you liked this and thanks for the comment. Hi Melody, I agree! Thanks. Yes, I had read that about Vancouver and after seeing it, I am not surprised. Thanks for the comment. Did you know that Vancouver is listed as the 4th most desirable city in the world? We missed the nightlife in Gastown but from what I read and from what you just said, it is obviously a fun place to be. Thanks for the comment. We took a tour of Vancouver (which we almost always do when in a new area) and the unusual clock was pointed out to us. When we went back on our own time, we got a close up look and got to listen to it as it piped out it's melody on the quarter hour. OK......I'm done for now describing Vancouver. Granville Island is another great place to visit and we spent a chunk of a day there. Chinatown, etc., I'll leave some topics for others to describe. We did as much as we could in our 5 days there and have loads of memories. Vancouver is a great place! If I would ever go back, I would concentrate on seeing other things next time, but would probably want to stay in that same hotel. The views were gorgeous! Ah, Gastown, a great place to go for music and food. I spent many an evening at the Lamplighter playing pool and enjoying a beer or two! A 16ft high steam clock; I guess I missed that.